Dr. Siegfried Hecker of Stanford University released a report on November 21, 2010 detailing his recent visit to the Yongbyon nuclear site in North Korea. 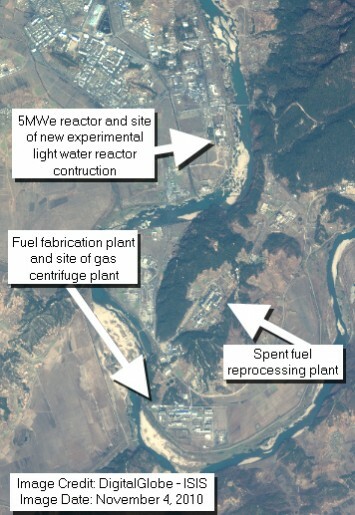 Hecker describes his visit to a building containing 2,000 gas centrifuges located on the site of the fuel fabrication facility at Yongbyon dedicated, according to his hosts, to producing low enriched uranium (LEU). He notes that the building is approximately 120 meters long and has a blue roof. 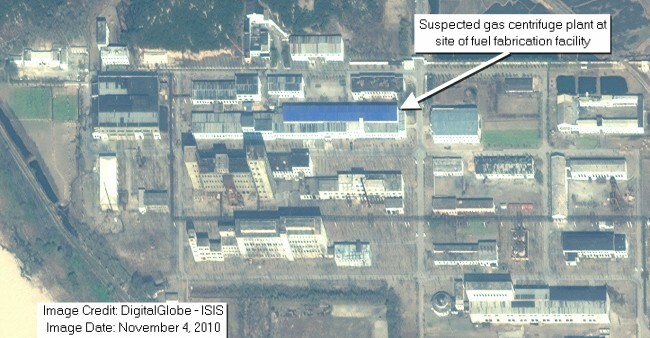 ISIS assesses that this building can be seen in a November 4, 2010 DigitalGlobe satellite image in figure 1 below. 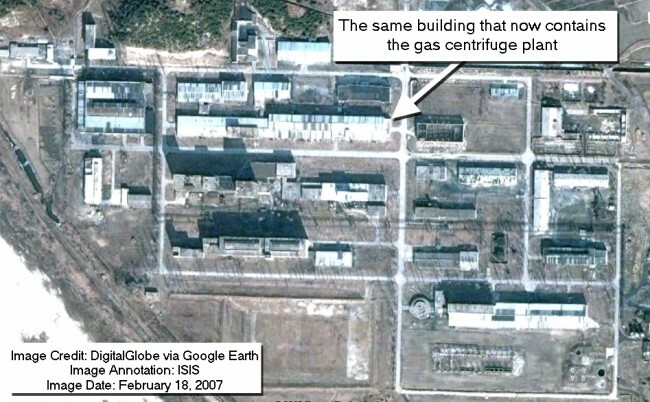 Hecker also noted that the building had been repurposed, as he had visited this building in 2008 at which time it did not contain centrifuges (figure 2 shows the same building in February of 2007). Figure 3 shows the location of the plant relative to the entire Yongbyon site. In an October 2010 report, ISIS assessed that “the data support that North Korea has the capability of building, at the very least, a pilot plant,” of gas centrifuges, with a pilot plant defined as between 500 and 1,000 centrifuges. If there are 2,000 centrifuges installed at the Yongbyon site, that number is greater but consistent with the ISIS finding, and thus not completely unexpected. Nonetheless, learning of the existence of this plant is extremely significant, and the new information requires deep study. It is also true that a centrifuge plant does not exist in a vacuum. It is still unknown where North Korea researches, develops, and manufactures centrifuges. The North Koreans told Hecker that the plant had just started producing LEU. Hecker was not told when this plant would be in full operation, and he and his colleagues were not in a position to determine that date. Of concern is how quickly North Korea outfitted this building at the Yongbyon site. The New York Times reported that administration officials concluded that the plant did not exist at this building at Yongbyon as of April of 2009, when the disablement process ended. To outfit a plant with 2,000 centrifuges this quickly suggests that this may not be the first gas centrifuge plant that North Korea has built. It is possible that North Korea built another plant previously and either transferred it to Yongbyon or simply built another one based on its experience of bringing the first, perhaps smaller, one into operation. Hecker reports the plant’s total enrichment capacity is 8,000 separative work units (swu) per year. With 2,000 centrifuges, the average is 4 swu per year per centrifuge, somewhat lower than the original G2. This German machine had a capacity of about 5 swu/yr-centrifuge; it was copied by Pakistan and called the P2. Hecker also reported that there were six cascades for an average of 333 centrifuges per cascade. This number is almost exactly double the number of P2 centrifuges in the cascades producing LEU in the Pakistani design provided to Libya by Khan network. The reason for this difference is not known. North Korea implied that the plant is configured to make LEU, which indeed may be the case. However, centrifuges are flexible and this plant could produce weapon-grade uranium. Based on the information about the P2 and the centrifuge plant design supplied to Libya, 2,000 P2 centrifuges could, under a different cascade configuration, make about about 33 kilograms of weapon-grade uranium per year. This value needs to be lowered since the North Korean centrifuge has a lower average enrichment output, yielding an estimate of about 26 kilograms of weapon-grade uranium per year, lower than what Hecker estimates. Hecker reports on a modern control room at the plant. ISIS learned that North Korean procurement entities obtained abroad modern computerized control equipment used to run a plant composed of centrifuge cascades. This equipment is dual-use, also used in the petrochemical industry, but it was the same as those acquired by Iran to run its centrifuges. ISIS did not learn who more recently supplied the plant with frequency converters or the subcomponents used by North Korea to make them domestically, but Iran and North Korea appear in some cases to use similar illicit procurement networks. It is possible that the North Korean plant(s) could be vulnerable to the Stuxnet worm. Figure 1. November 4, 2010 DigitalGlobe satellite image of the fuel fabrication facility at the Yongbyon nuclear site in North Korea. In his report, Hecker noted that the new gas centrifuge facility has a blue roof and is approximately 120 meters long. ISIS assesses that this building is this gas centrifuge facility. Figure 2. DigitalGlobe satellite image on Google Earth showing the same building at the fuel fabrication facility on February 18, 2007. The building was later repurposed to house gas centrifuges. Figure 3. Wide view DigitalGlobe satellite image of the Yongbyon nuclear site. To the north is the site of the disabled 5MWe reactor where North Korea is constructing a new experimental light water reactor. Towards the southern end of the site is the disabled fuel fabrication facility. This facility contains the new gas centrifuge facility.